B. Thomas (Arlington, Texas, United States) on 14 August 2018 in Animal & Insect. A squirrel trying to stay cool in the Texas heat. There is also another visitor there. Do you see it? Hot weather is a hard time for forest animals and birds. In Finland, in small lakes, dead fish are too hot in waters where the oxygen level has dropped too low. Two tree huggers. An excellent capture. Such sweet survivors . . Very wel timed, nice photo as a result. Always great to see these Squirrels in the trees. Nice to also capture the frog or Lizard ? Oh, really cute one ! Great image and title and spotted the salamander/lizard. Hug trees, this they say gives good energy. There is a lizard too...looking up here !! A beautiful catch of the two. The smaller one seems to be a lizard. 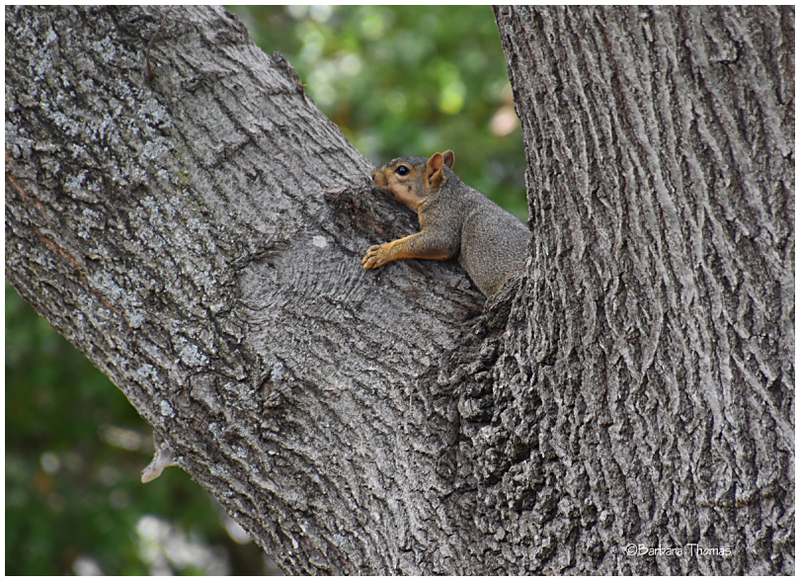 Squirrel is smart coping with the heat. This squirrel is looking quite pooped in the hot weather! Hopefully the visiting lizard doesn't STartle him. Happy ST! Fantastique animal entre les formes des troncs superbe vue. A wonderful portrait of this resting squirrel. I have seen them laying out occasionally on the shady roof of my shed when it is hot. The lizard looks curious! Happy ST! Yes indeed a tree hugger !